In Claude Debussy’s 1910 prelude “La cathédrale engloutie” (“The Sunken Cathedral”), shuddering waves of chords grow and then drown out in tribute to a mythical cathedral rising out of the sea and then disappearing again. 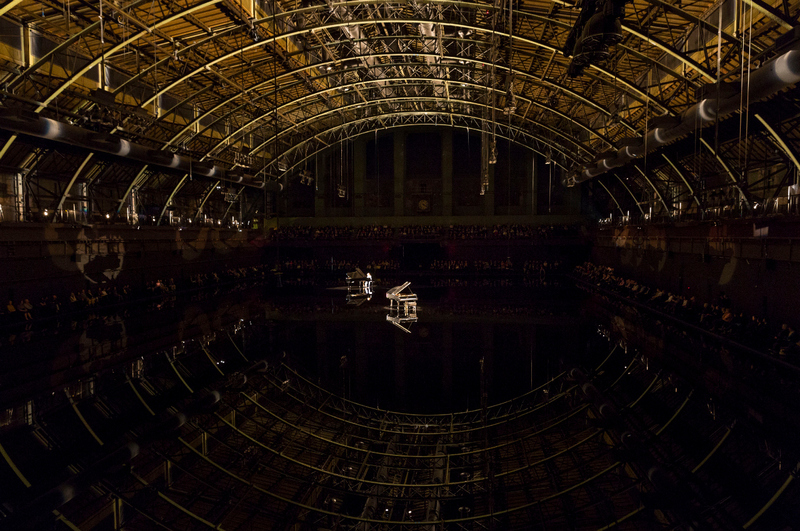 In Douglas Gordon’s new “tears become… streams become…” installation at the Park Avenue Armory, the rippling notes are provided each night by pianist Hélène Grimaud, who plays a Steinway encircled by a reflecting pool of 122,000 gallons of water. In the mirror of water conjured by the Scottish artist, Grimaud’s notes evoke the rising of some magical copy of the Armory’s soaring archways. 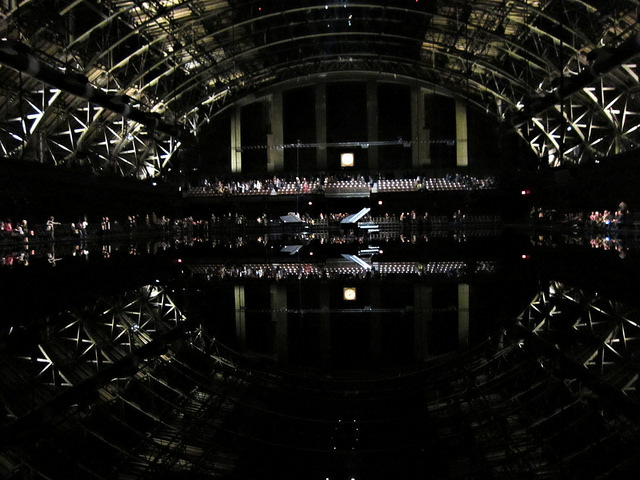 However, the audience knows that the water is just a few inches deep, part of an impressively engineered illusion that is the latest spectacle to transform the Armory’s 55,000-square-foot Drill Hall. 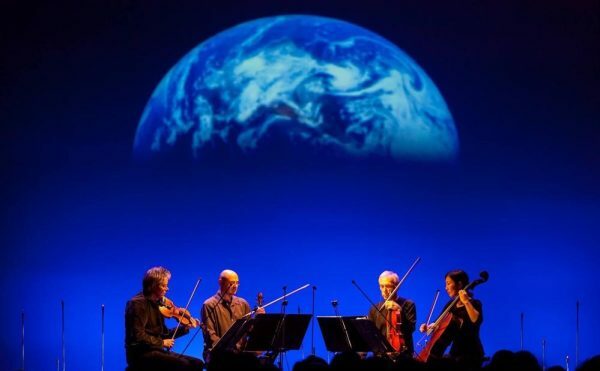 Before the French pianist’s hour-and-a-half performance of music inspired by water, from Ravel to Liszt, the audience sits in uneasy silence as water slowly gurgles up from the vast and barren floor, gradually pooling over the space. 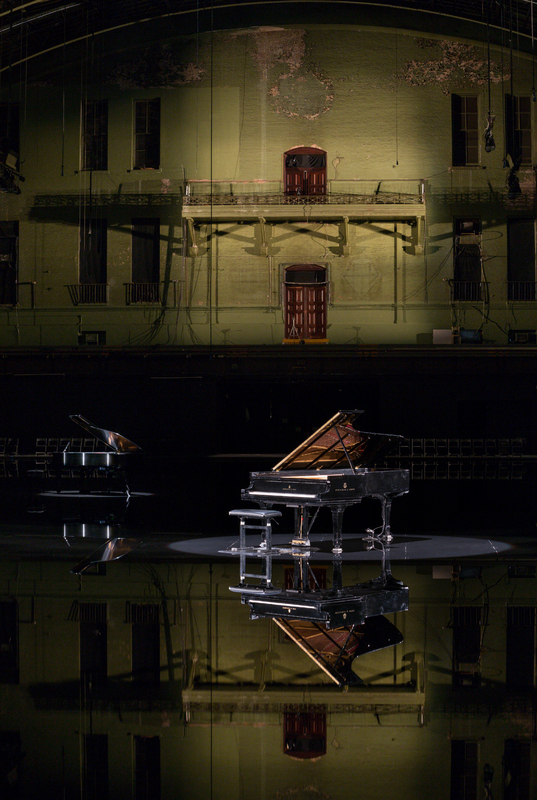 It’s a very different experience when you come during the daytime exhibition hours, when no musician plays, but a second piano installed by Gordon in the reflecting pool bangs out inaudible tunes, all its wires disconnected except a lone, low C. The water then is already smooth and placid over the 28,000 square feet of the pool, duplicating the ceiling of the Drill Hall as if it’s some great hull of a ship. Any visitor who dares to bring his or her hand anywhere near the surface it is quickly scolded. Grimaud is only performing 10 nights in the enigmatically titled “tears become… streams become…” installation, which is on view through January. 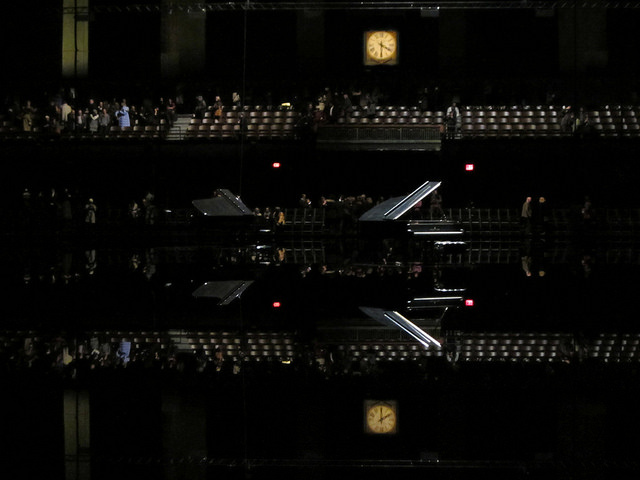 The vacant pianos might make you feel like you’re missing out on the main event, but the daily hours are arguably the main part of the show. Having attended the performance and spent time sitting in the installation while the muffled piano played its songs with no notes, I can say that the daytime installation is much more meditative. The long wait for the water to cover the floor, Grimaud’s undramatic entrance and exit plodding through the water in the dark, and the audience positioned distantly along the perimeter of the pool make for a disconnected experience, in spite of her excellent and spider-like playing. Gordon is probably better known for torching pianos, as he did in The End of Civilisation, a film in which flames consume one of the instruments on the border between England and Scotland. 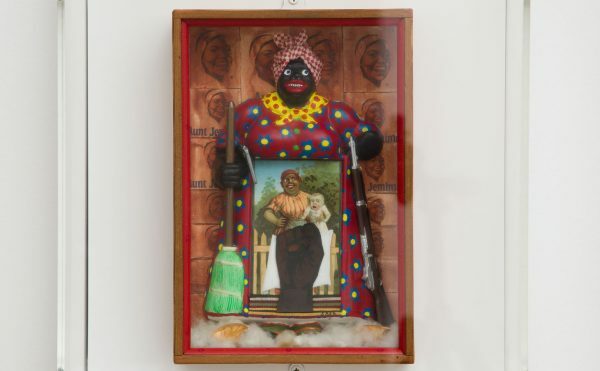 One of the resulting charred pieces is currently on view at Gagosian on Park Avenue. 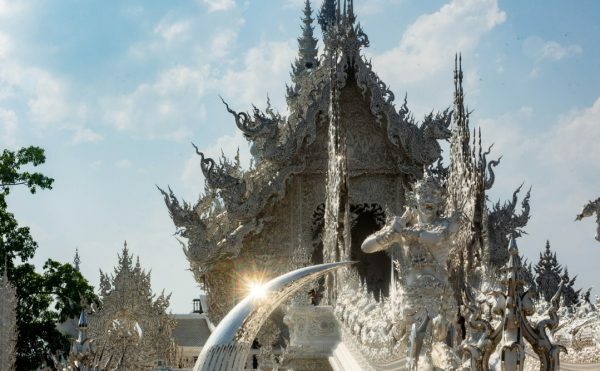 His Armory installation, meanwhile, is undeniably striking, but for all its initial, bombastic visual drama, it lacks the depth to give visitors the eerie unease of being in an impossible space. 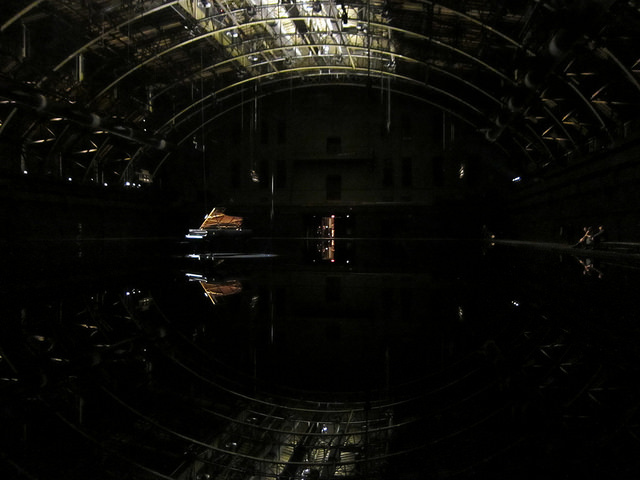 Douglas Gordon’s tears become… streams become… continues at the Park Avenue Armory (643 Park Avenue, Upper East Side, Manhattan) through January 4. 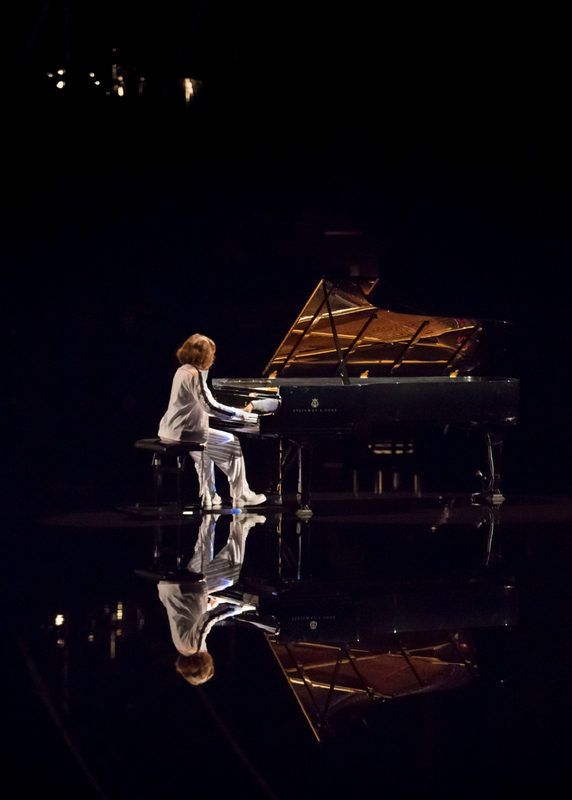 Performances by Hélène Grimaud continue through December 21.